Trimmed it down into Chops/Cutlets, french trimmed Ooh la la. 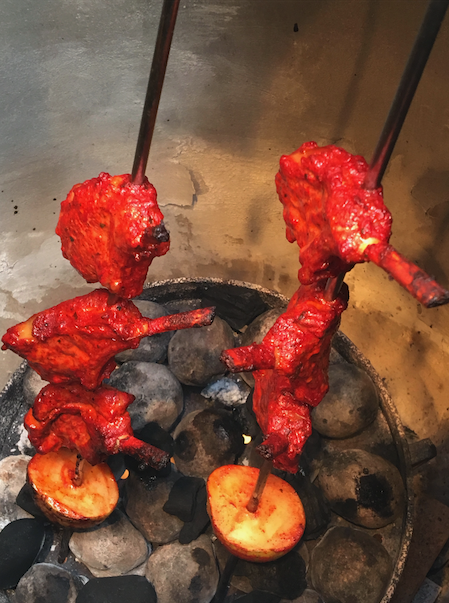 Marinated overnight, then in the Tandoor for 15 to 20mins. Nice medium cook, using the look and feel of the meat. 1. Plated main dish, served with an Aloo Bhorta, crunchy salad and mustard mayo. Reduced by half is a great starter. 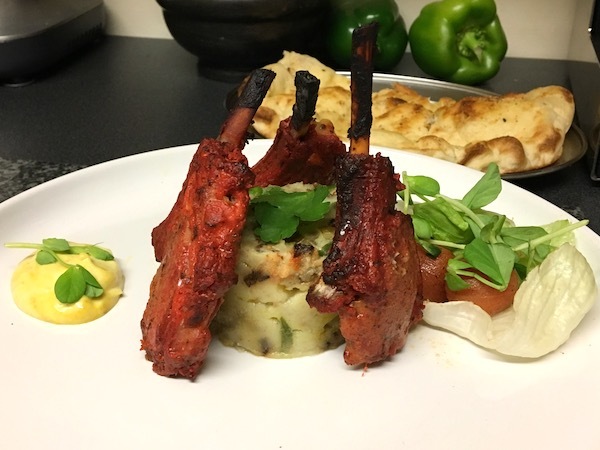 How good is Tandoori lamb? Both of those dishes look absolutely superb CT. 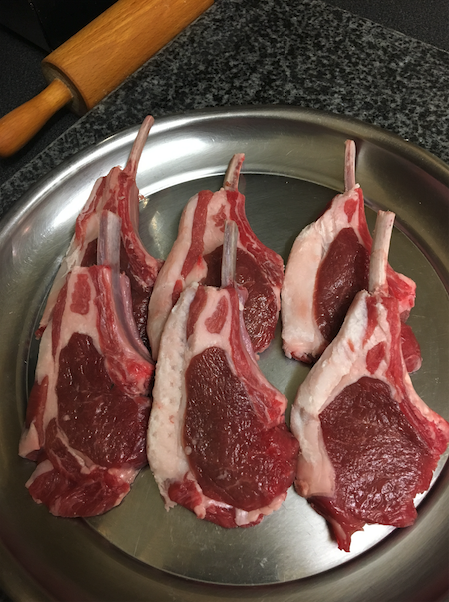 I still have another 8 loin chops in the deep freeze for when I'm a bit more mobile. I'm getting better daily but still struggle to be on my feet for too long. Next weekend maybe. I also picked up 1.5 kg each of reduced price chicken breast and thigh fillets so I can feel a Tandoor weekend approaching, hopefully with enough leftover to do a CTM. The nearest I've been to an edible curry in the last month is a sausage curry and rice for dinner last week, but I do thoroughly enjoy it. They tried to serve me something in hospital that they said was chicken curry. It was one of the only meals I left untouched. The others were odd things they called fish fillets. Clearly the fish were a very odd shape. The nearest I've been to an edible curry in the last month is a sausage curry and rice for dinner last week, but I do thoroughly enjoy it. They tried to serve me something in hospital that they said was chicken curry. It was one of the only meals I left untouched. Hopefully not one of those woeful attempts at a “curry”which is closer to a fruit stew and with minimal, if any spices? Fruit flavoured “curry sauce” in jars from UK supermarkets was what first set me on a course to learn how to cook a real curry at home. I reasoned that even if I couldn’t get a perfect takeaway curry flavour at home, I could at least improve on what the supermarkets were calling curry. Sorry, off topic I know. 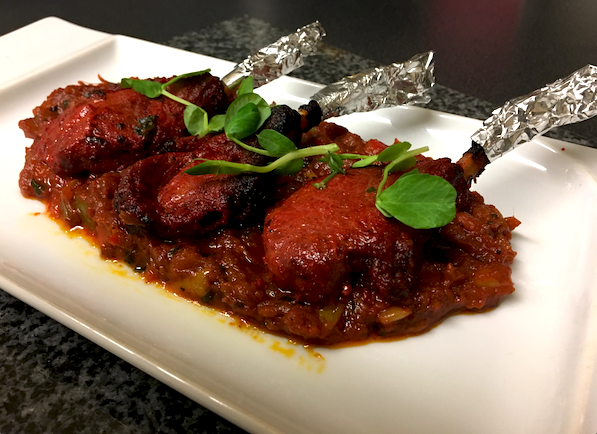 Back on topic, lamb Tikka has always been a favourite of mine but it’s a real challenge to get to tender. Even in restaurants it is often “chewy Tikka” to quote a certain person’s posting handle. Looks great, Chewy! 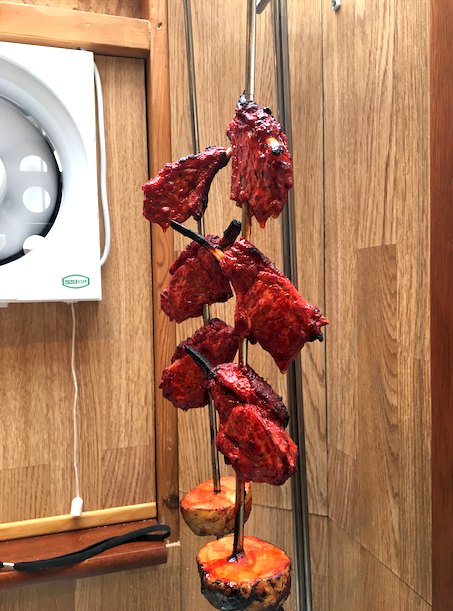 The recent posts of tandoori meats inspired me to go out and buy a load of chops. The marinade will be sorted later today! PS: I also take your point in the other recent thread about 1970s-style food. Your photos above (and many other of your previous foodie photos) are illustrative of new ways to serve modern dishes using well-established recipes and techniques. Indian food doesn't just need to be about curry, rice and naan - although, nothing wrong with that either! When my stretch was still beans-on-toast, I was a big fan of Vesta Paella and Vesta Chow Mein with Crispy Noodles! and guarantees soft, juicy and delicious meats. Look forward to your reports after your healing and improved mobility. DB use Spring Lamb for tenderness. be all about and look forward to viewing your dishes.